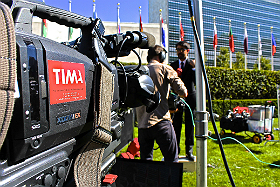 TIMA: live broadcast services at UN New York. 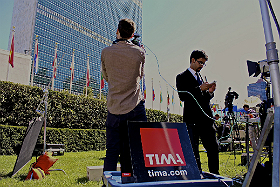 TIMA – The International Media Associates – a global facilities and content service provider - has secured office space within the UN and is one of only 15 media companies worldwide to be awarded dedicated UN fibre circuits greatly improving access to clients. This new UN status recognises TIMA’s growing standing within the international media community and is part of the company’s on-going commitment to be at the heart of news and decision-making worldwide. “Dedicated UN fibre circuits mean that TIMA can access all UN pool material and distribute it live or recorded to customers around the world,” said Alla Salehian, CEO of TIMA. “At a time of considerable international tension and conflict we believe this greater access will provide important background to today’s headline stories,” he added. TIMA has also been allocated four dedicated positions on Press Island to provide live feed services to broadcast clients. From the UN in New York, TIMA can now distribute live and recorded content to broadcasters around the world via its dedicated fibre circuits, provided by Hibernia Networks, to Washington DC and Europe as well as via its satellite uplink units in the US and London. As the UN prepares to meet for its 68th session of the General Assembly, TIMA staff and crew will be covering the debates and developments on a range of topics. The situation in Syria is expected to dominate discussions and a possible meeting at the UN in New York between US President Obama and newly elected Iranian leader, President Rouhani, has been mooted.